After months of effort, Victor is successful in bringing his creature to life. But once alive, the creature's appearance horrifies him—he thinks of it as a monster. Victor, a flawed man, messes with Nature, and things literally get ugly. Victor runs from the room and tries to sleep, but nightmares of death and tombs wake him, and he opens his eyes to see the monster by his bed, reaching out and grinning. He runs, and spends the night outside. Victor, the creator, abandons his creation. Because it's ugly he imagines that it's evil. Victor's innocent belief in himself is gone. Still avoiding his apartment, Victor wanders Ingolstadt, and runs into Henry Clerval, who has come to university to embark on "a voyage of discovery to the land of knowledge." Clerval's words, though innocent and earnest, now sound dangerously ambitious and naïve. Victor checks to see if the monster is still in his apartment, and is overjoyed to find that it isn't. He invites Clerval up, but once there falls ill with a "nervous fever," which lasts for months. Clerval nurses him, not revealing the illness to anyone. When Victor recovers, Clerval asks Victor to send a letter to his father and family, and gives him a letter from Elizabeth. Victor makes the mistake of isolating himself and keeping his secret all to himself; it eats away at his peace of mind and ruins his health. Knowing he has a secret but not what it is, Clerval tries to reconnect him to society. Florman, Ben. "Frankenstein Chapter 5." LitCharts. LitCharts LLC, 22 Jul 2013. Web. 13 Nov 2018. Florman, Ben. "Frankenstein Chapter 5." LitCharts LLC, July 22, 2013. 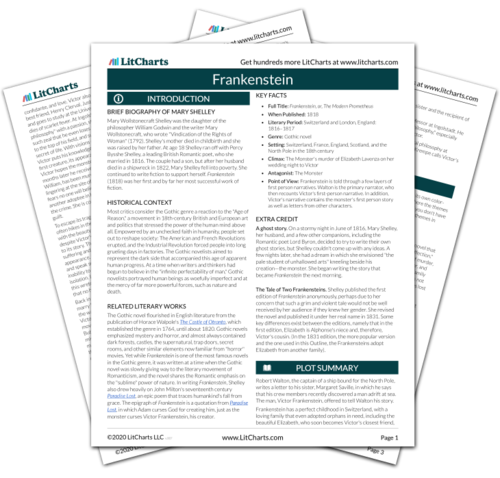 Retrieved November 13, 2018. https://www.litcharts.com/lit/frankenstein/chapter-5.